A chilly post-Christmas run in Ithaca! It's no secret that I'm not much of a regular runner, but when I do run, I want to be comfortable doing it. This winter, I learned a lot about how to layer for cold weather running, and got to try out some great gear in the process. I didn't realize how much I loved vests until I tried Columbia's Electro Amp Core Vest, but it's a little too warm for vigorous activity in Philadelphia's mild autumn and early winter weather. 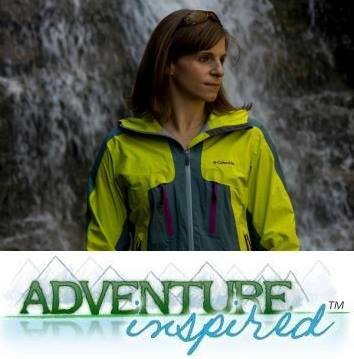 I bought the Marmot Summerset Vest from Sierra Trading Post as a second thin layer for running outdoors and hiking. I took it out on runs in Philadelphia when temperatures were a comfortable 35ºF, then again in upstate New York on a 20ºF day with light winds and light snow. One of my biggest complaints about vests and jackets on runs is that they don't stay put; they ride up, flop around, and generally get in the way. The medium Summerset Vest fit me like a glove and moved with me while I ran. It's water repellent, breathable, and kept me warm enough in the 20º temperatures, but too warm when it was above 30º. The pockets are a bit high for me, but I don't generally keep my hands in my pockets when I'm running anyway. Overall, I'm a big fan and would recommend it for vigorous activity in colder weather. 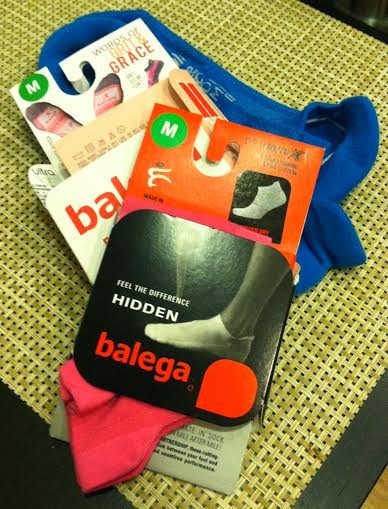 So many Balega socks, so little time! The right workout wardrobe starts from the ground up. Without the right pair of socks, your feet can overheat or get too cold, you can develop blisters, or worse. I'd heard nothing but praise for Balega socks and after testing two pairs on runs and in my CrossFit gym, I can understand why. The Hidden Contour socks are thin, but still soft and provided enough cushion for street running and jumping around in the gym. They provided more structured, tighter fit than other socks I've tried, which helped support my arches. The Hidden Comfort socks were too thick for the gym, but as soon as I took them outside in chilly weather, I was grateful for the extra cushioning and warmth. Aside from how soft and comfortable the fabric is, my favorite feature of both pairs of Balega socks I tried is the heel tab. It prevents the sock from slipping into the heel of your shoe and kept my shoe from rubbing against my achilles tendon. Overall, I'll definitely be adding more Balega socks to my sock drawer in the future. When it comes to lower body workout wear, fit and feel are super important and as a result, I'm picky about what I'll don during CrossFit workouts and running. I took Merrell's Leelani Cinch Leggings out for runs in 20-40ºF weather to see how they held up in the cold, and to my CrossFit gym to see if they'd measure up during our high intensity workouts. After the runs and workouts ended, I found myself hard pressed to take them off because of how soft and comfortable they are. Merrell's M-Wick fabric kept my dry while I was sweating in the gym, and kept my legs just warm enough while I ran outside. Of course, the last thing I want to think about while I'm squatting during a workout is unnecessary exposure, and I found the fabric thick enough to prevent that from happening. The size medium fit my calves and thighs, but was a bit large on my waist. The 29-inch inseam is a bit short on me and I didn't make use of the cinch feature in the cold weather, but it's a great aesthetic feature. Overall, I love the tights and recommend them for outdoor activity in moderate cold as well as for general workout activities. Plus, if you're into colors, there's a super bright option available. Merrell provided me with a complimentary pair of the Leelani Cinch Leggings and Balega provided me with complimentary pairs of socks, but the Marmot vest was my own investment. As always, the opinions expressed here are my own! Have you tried out any of these? 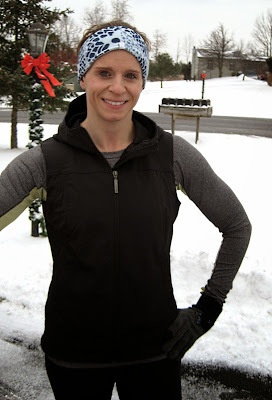 Whats your favorite cold weather running outfit? Leave a comment!